Karen Dion steps out of Sweden and into one of those creative, controversial dots on the map. I’m quite willing to go along with my friend’s idea to visit some sculptures buried in the depths of a southern Swedish forest, but as I stub my toe against the thick root of a tree and fall headfirst into the damp earth, I have to question what kind of artist would decide this is a good place for a project. But then again, other people’s opinions don’t seem to be of much concern to artist Lars Vilks. Vilks is better known for his ability to produce art offensive enough that it earns him death threats and a bounty of $100,000 on his head than for creating sculptures from salvaged materials in a Swedish nature reserve. A former art professor, he submitted three drawings to a 2007 exhibition on the theme “The Dog in Art.” Vilks’ pieces depicted the prophet Muhammad as a roundabout dog — a form of street art popular in Sweden at the time. The drawings provoked accusations of blasphemy, debates about free speech, a burning of the Swedish flag in Lahore, and threats of murder. But before he became embroiled in international controversy, Lars Vilks was just an eccentric artist who, in 1996, had declared the founding of a micronation in southern Sweden’s Kullaberg Nature Reserve. 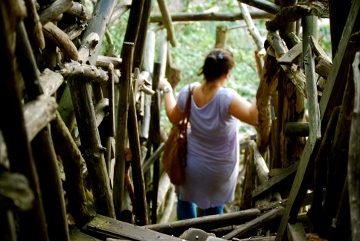 In 1980, Vilks built two art pieces in the reserve in Skåne. He made Nimis from 75 tons of driftwood and Arx from stone. The local council discovered them two years later and, saying that building within a nature reserve was illegal, demanded their removal. After losing appeals against the decision, Vilks retaliated by declaring the square kilometer of land where the sculptures were located to be the newly founded independent nation of Ladonia. While no one actually lives in Ladonia, there are 14,000 Ladonian citizens. You can become one too just by filling out an application — nobility costs extra. Ladonia has its own ministry, royal family, flag, currency, postal service, and two national anthems. It’s all done a little tongue-in-cheek, but, when 3,000 Pakistanis applied for immigrant status in 2002, asking Vilks for the address of Ladonia’s embassy, it became apparent that not everyone was in on the joke. Our own journey to Ladonia takes us through the seaside resort of Mölle and little town of Arild, whose residents’ almost foreign-sounding Swedish dialect seem like preparation for our departure from the nation. We pull up by a lonely maypole in the Kullaberg reserve and begin the trek. …we should’ve expected this; this place doesn’t really exist anyway. Since Ladonia is not officially recognized, it doesn’t appear on maps. The only way to navigate through the woods is by following yellow arrows painted on the trees. True to form, these haphazard signs are misleading — perhaps intentionally. The first one we see has 1.2 km painted underneath, so we’re frustrated when, after walking for at least 15 minutes, we come across the next arrow and it says 1.1 km. It carries on like this, and we suppress thoughts of giving up by saying we should’ve expected this; this place doesn’t really exist anyway. A little longer and it begins to feel like a hike. The arrows point us up hills, over rocks, and through clusters of thick, inflexible branches. The climb is becoming slippery in my flip-flops — I hadn’t dressed for the walk. The sun is still strong, even in the early evening, and I feel my shirt start to dampen with sweat. We keep climbing. And then there it is. Stretched out in front of us is a tunnel made of wooden pieces. It dips down and stretches as far as the seafront, where the centerpiece stands at the shore — the great sculptures of Nimis. We walk through the piece, tottering unsteadily over thick sticks nailed together to form the labyrinthine walkway. Rogue nails that have worked their way out of the wood point at my feet — bare now to make walking easier — so I try to keep my eyes turned down. 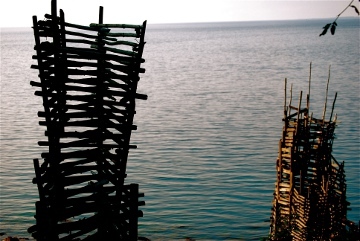 But I can’t help but look around at this place — Ladonia, this empty, fantastical nation. The tunnel spits us out by the shore, and it’s just the two of us — just two inhabitants of an entire nation. We each choose a rock to sit quietly on; the only sound is the waves lapping the rocky beach. My breath settles and I feel the peace that comes with the absence of anything anchoring me to a tangible place. There’s something impossible about sitting here in a conceptual country, under a sun that still burns late in the evening, having walked through a nation that is an art piece, that is not even supposed to exist. I am neither here nor there. I don’t know how much time has passed, but in the distance I can hear voices. Sweden is encroaching on Ladonia. Taking this as our cue, we start the walk back. We pass the new arrivals on our way. For now, this nation belongs to them. Ladonia is in a nature reserve between two small resort towns, Arild and Mölle. Both offer several hotel choices if you wish to spend the night. 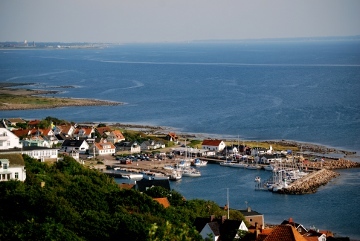 Mölle is off the coastal highway 111, and the nearest airport is Ängelholm, approximately 19 kilometers (12 miles) away. Mölle is 35 kilometers (22 miles) northwest of Helsingborg and around a two-hour drive north of either Copenhagen or Malmö. If you don’t have a car, you can take a train to Helsingborg from Copenhagen or Malmö, then a bus to Höganäs and then to Mölle. From Mölle, it’s 4 kilometers (2.5 miles) to the Kullaberg Nature Reserve. 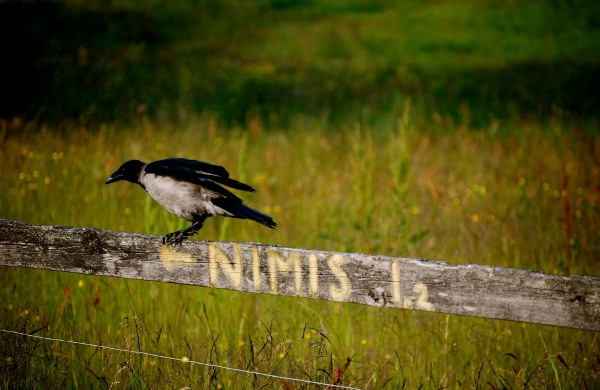 The path to Nimis begins at Himmelstorps Hembygdsgård — a preserved 19th-century farmhouse inside the reserve. Follow yellow arrows and “N”s painted on tree trunks and fences. The walk will take around 30 minutes — depending on how lost you get — starting off easy and becoming tougher and steeper. For more controversial destinations, read about 5 Compelling Reasons To Visit Banned Countries.